New Hampshire native, famed redhead and last year’s second best Rider of the Year Pat Moore has done it again. Last year, with Volcom’s Mr. Plant, Pat dove into a year-long project centered around his travels and featuring his friends. This past winter, Pat went the way if the internet, but with a similar approach. 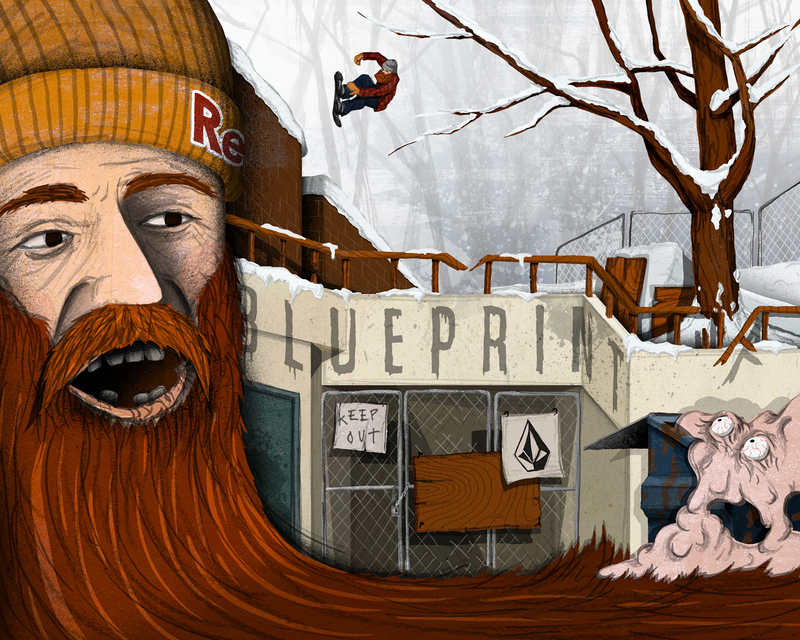 Red Bull Media House’s Blueprint 2 is a behind-the-scenes look at what makes Pat tick and it delves into something that many people overlook about Pat, and that is that he cares very deeply about snowboarding. Not just the tricks or the clips, but the culture and the history of our sport, and this is evident in nearly every episode of Blueprint 2. From the Swiss Alps to Salt Lake City and Jamestown, New York to AK, riders as young as Ben Ferguson and as seasoned as Jamie Lynn, Jeremy Jones and Bryan Iguchi are tapped by Pat to accompany him in his worldwide tour to compile footage. Intertwined into the riding is an expertly-edited narrative by Pat and his comrades, spliced together than none other than former Forum lensman Jeremy Pettit and the result is a show that is easily relatable, even though the riding is out of this world. Crowley Lake, California’s Eric Jackson—a man who has appeared on this list before—simply states, “Every episode got me hyped,” while French Canadian alpine aficionado DCP speaks to the show’s variety and insightfulness, saying, “He shreds with all the legends, kills all the spots and gives a chance to guys like Ben Ferguson and Jamie Lynn; they both have epic methods! I love Pat’s commentary and inspirational words of wisdom.” However, it’s Pat’s backcountry mentor and former teammate Devun Walsh who sums up Pat’s series perfectly. ““Pat more is the man. Boss. Legend. He’s doing great things for boarding and he rips the streets and backcountry. Loved seeing Jake Welch and Jeremy Jones, too. Style for days. And Jaime and Guch are huge bonuses.” When Devun Walsh calls you a legend, you better stick to exactly what you’re doing, so here’s hoping that Pat takes Devun’s words of wisdom to heart and hopefully the redhead will put out more Blueprint-style episodes in the coming years. At its core, this ranking is intended to celebrate the riders who were the most exceptional professional snowboarders from December 1st, 2014 to November 31st, 2015. These riders are recognized for the fundamental responsibilities of being a professional snowboarder. This is based strictly upon the amount and quality of video parts, contest results and magazine coverage with an emphasis on diversity of terrain and discipline variance. Ideally, this process brings us to the individuals who most influenced the progression of snowboarding on a consistent basis over the course of this past season. For 2016, our Rider of the Year award rollout will once again be an exclusively digital happening. Each weekday from Monday, January 4th until Monday January 25th, SNOWBOARDER will highlight a different rider’s achievement, culminating with the ultimate praise of naming our 2016 Rider of the Year. The following icons are those whose opinions and votes were submitted in order for SNOWBOARDER to arrive at our 2016 Rider of the Year tally: Danny Kass, Sage Kotsenburg, Austen Sweetin, Ståle Sandbech, Scott Stevens, Leanne Pelosi, Jake Blauvelt, Mikkel Bang, Travis Parker, Bode Merrill, Louif Paradis, Torstein Horgmo, Mikey Rencz, Eero Ettala, Eddie Wall, Jeremy Jones, Andreas Wiig, Gigi Rüf, Marie-France Roy, Chad Otterstrom, Mark McMorris, Kevin Jones, Jamie Anderson, Ross Powers, Halldór Helgason, Jess Kimura, Mark Sollors, Eric Jackson, Danny Davis, Annie Boulanger, Hana Beaman, John Jackson, Wolle Nyvelt, Lukas Huffman, JP Walker, David Carrier Porcheron, Scotty Lago, Dan Brisse, Pat Moore, Devun Walsh, Nicolas Müller, Romain De Marchi, Chas Guldemond, Cheryl Maas and Frederik Kalbermatten.